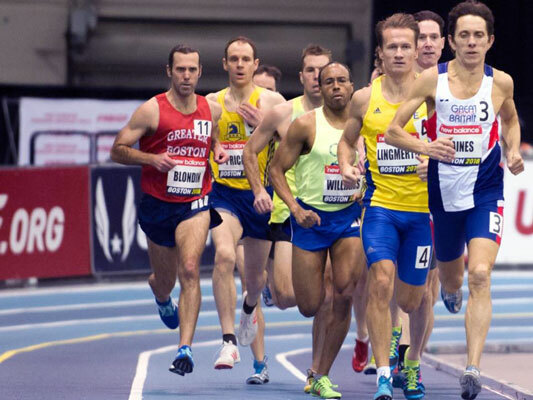 Running in a GB vest at the New Balance Masters Mile race in Boston at the weekend Adrian Haines clocked a time of 04:40.97. As a V50 this sets a new UK record, smashing the previous best of 4:53 by the length of the straight. It will need to be ratified but should then appear in the Power of 10 lists (though against the club name of Adrian's first claim club). It is only a pity that all of the BBC cameras and reporters were otherwise engaged at the Winter Olympics. However you can see the whole race here: https://www.youtube.com/watch?v=x3rqIIiV6Mw . You will note that although Adrian was competing against younger men, capable of running away from him, it was he who led and set the pace for the first four laps. We all love running but we decided that we would allow other loves in your life to take precedence over running on the evening of Valentines Day this Wednesday. Instead we are launching a new club event of a lunchtime run targeted at non-office workers and retirees. Meet by the café at Rickmansworth Aquadrome at 12 noon ready to run for about 45 minutes. The run will follow the tracks used by the Rickmansworth parkrun and be flat and scenic around the lakes of the Aquadrome. There is a large free car park and toilets available. After the run there is the option to take some refreshment in the cafe. And if you are not up to running just now...we'll meet you in the cafe from 12:45. Roderick Hoffman / Steve Newell more info, email Steve. 2018 Speedbird Ladies Race - Wednesday May 9th from 19:00 on Harmondsworth Moor. 2018 Concorde Five Mile Road Race - Sunday 17th June from 10:30 around Cranford and Harlington. Details of both events will follow in subsequent weeks. Also note that contrary to previous expectations there could be a BA Fun Run again this year, on a Thursday in July, though details still need to be confirmed. Note: The organisers no longer require addresses. The Men were at Lloyd Park. 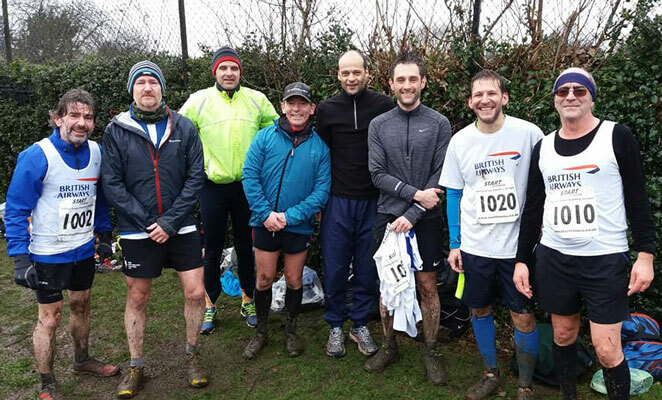 At a cold, bleak, muddy, slippery, slimy and hilly Lloyd Park near Croydon we had our best result of the season. A great performance by the team meant we ended the day in 5th place but after my initial expectation of improving our league position I discovered that we remained three places from the bottom just like last year but we closed to within a few points of Lingfield and were well clear of the next team. As always, Paul Knechtl led us home with a great 8th place. Ed: The photo shows most of the team members from Saturday. If it was a caption competition photograph I'd submit "I understand now why you said bring long socks". We have blooded 4 new runners this year, all of whom seemed to enjoy it although I could understand if Ross Davies didn’t after his baptism on Saturday in the worst conditions that we are likely to encounter. Barry Walters was 3rd in the over 60 category for the season thanks to the fact that the older runners only need to count 3 races so Barry’s recent injury and no show on Saturday didn’t affect his position. This category was won impressively by an over 70. Thanks to Paul Knechtl, Richard Ruffell, Gary Rushmer, Chris Kelly, John, Mark and Graham Taylor, Matthew Stratful, Paul Davis, Ross Davies for turning out on Saturday and to Tim Bellars, Chris Evans, Barry Walters, Steve Hillier, Denis Foxley, Jeremy Short, Ian Cunningham, Colin Haylock and Duncan Wright for earlier performances this season. We start this week at Black Park where Barbara Allen(29:47) of Datchet Dashers celebrated her birthday in style and became the 15th parkrunner to reach 500 runs and qualify for a turquoise T-shirt. Like many, but not all, of the 500 club runners she did her early runs at Bushy Park. We are in for an interesting few weeks. Currently our own Alan Anderson is on 495 runs and we expect him to reach 500 at Gunnersbury on St Patrick's Day, 17th March. Alan has run 210 times at Bushy Park and 264 so far at Gunnersbury. Just one ahead of Alan is Andrew Wyeth who has run all of his 496 at Basingstoke. Basingstoke parkrun started when the Bushy timetrial had already been going for almost four years and last week was run for just the 521st time. Andrew missed the first month completely and only ran in twelve of the first 20. He can’t have missed too many since that stuttering beginning. Just two behind Alan is David Tyas (Amadeus), one of our former members. March will be a busy month for parkrun HQ. David Duggan(28:53) continued his tour of South Australia and hopped onto a ferry to Kangaroo Island near Adelaide to take in the 16th edition of the parkrun there. Numbers are still quite small at this fledgling event which attracts a field of about 20. With Kangaroo Island the club jumps to 386 different parkruns. David may squeeze in one more in Australia before returning home and with ice causing a cancellation at Bedfont Lakes this week who would blame him for staying downunder a bit longer. The final fixtures of the Surrey League cross country season kept some of our runners away from a parkrun this week but three of our women achieved course personal bests and improved club records. Julie Barclay, 22:13 at Frimley Lodge; Caroline Cockram, 24:47 at Northala Fields and Sarah Gordon, 33:46 at Rugby. We welcomed back to parkrun Paul Watt who had his first full 5k run of the year, following his injury at Christmas. HHRR will be entering the summer league runs around London again this year ( http://www.thesummerleague.uk/ ) and I think could include some folk as second club claim runners. Let me know if there is interest. The website shows that this is a series of Sunday fixtures held by like minded London running clubs each featuring a 5 mile or 10k race, races for under 6s and for 6 to 14 year olds, a relay and a picnic. This sounds particularly attractive for running families. The provisional dates are 3rd June (Gunnersbury), 17th June (clashes with Concorde Five), 1st July (Dulwich), 15th July (Regent's Park) and 5th August (Battersea Park). If you might be interested in joining Hayes and Harlington Road Runners at one or more of these could you contact John directly (and then prepare to send me a written report for the digest!). This year's top intra-airline sporting event, the World Airline Road Race, is from September 26th to 29th with race day for the 10k and 5k races of Saturday 29th September. parkrun addicts should be able to run the Cloverpoint parkrun after the WARR 10k! The WARR homepage is https://worldairlineroadrace.org/ (and features a UK record holder on the start line photograph!). A third, budget hotel for this year's WARR is now available for booking. Seasonal outdoor pool with a year-round whirlpool, on-site Restaurant and Lounge, and complimentary parking. Room amenities include in-room coffee makers, high speed Internet access, hair-dryers, robes, kettles, security view ports, key card locks, in-room safes, hairdryers, iron & board and alarm clock radios. Location is ideal – downtown Victoria on the shore of Victoria’s vibrant Inner Harbour. In fact, we’re just a short walk – or carriage ride - from the Trade & Convention Centre, Victoria’s picturesque Parliament & Government Buildings, Beacon Hill Park, Royal BC Museum, restaurants, shopping and Victoria’s most sought-after attractions. Rate is $149 Cdn plus tax in September, and $119 Cdn. plus tax for October. Cancellation policy is 3 months prior to arrival. The organisers of the Thorpe Park half have put out requests for marshals. The BA club has enough marshalling commitments itself but if anyone does fancy the morning's work in that area then perhaps you can sign up via Bedfont Lakes parkrun who would use the thank-you fee to fund new equipment for their parkrun - new buckets to help clear the puddles perhaps? The very organised Valentines 10k saw 461 finish. The weather being freezing cold and a strong wind over the second half lowered most times including the winner Scott Overall who just missed the 30.00 min. mark that he would normally clear. Janet Cunningham ducked under 1hr. in a 59.58 and placed 332nd, a good performance especially after her run in the Surrey Ladies XC Lge. the day before at Richmond over a tough muddy/windy/drizzly course so two tough days; well done Janet. Our final runner was Jasvir Singh still in humorous form and cheerful and polite as ever, Jasvir was 361st in 61.40. All four members are yearly entries. Copywriter to write a 100 word report on any running event each week (or month) for inclusion in the weekly digest. Apply with text and pictures to the editor by 19:00 any Monday.